Birthplace : Fairburn, Georgia, U.S.
James Eric Berry (born December 29, 1988 in Fairburn, Georgia), nicknamed "The Fifth Dimension" is an American football safety for the Kansas City Chiefs of the National Football League. He was drafted 5th overall in the 2010 NFL Draft. He played college football at Tennessee. Berry played at Creekside High School in Fairburn, Georgia. There, he was a standout in track and football. In track, Berry was the anchor leg of the 2006 AAAA State Champion 4x400m relay team. Individually, he was the 2005 AAAA State Champion in the 200m. Berry played cornerback and quarterback, earning a 37-5 record as starting quarterback at Creekside. Following his stellar high school career, Berry was invited to play in the 2007 U.S. Army All-American Bowl. Berry was considered the top player in Georgia and the top cornerback prospect by every recruiting service and the #3 player in the nation by Rivals.com. College: Versatile and athletic defensive back joined the Chiefs as the club’s first-round pick (fifth overall) in the 2010 NFL Draft ... The first safety tabbed with a top-five pick since S Eric Turner was the second-overall pick by Cleveland in ’91 ... Can work at either safety position and also saw limited duty at cornerback during his tenure at Tennessee ... A two-time unanimous All-America pick, his 494 career INT return yards trail only former Florida State CB Terrell Buckley (501) in NCAA history ... Finished fifth in Tennessee annals with 14 career interceptions ... Started 39 career games, 37 at strong safety, one at left cornerback and one at nickel back ... Tallied 245 tackles (157 solo), 17.5 tackles for loss (-45.0 yards), 3.0 sacks (-11.0 yards) and 14 INTs for 494 yards with three TDs ... Also had 31 passes defensed, four fumble recoveries, two forced fumbles and three QB pressures ... Rushed seven times for 37 yards and caught one pass for three yards ... Returned six kickoffs for 132 yards and added 14 special teams tackles ... Entered the draft with a year of eligibility remaining. 2009: Started all 13 games ... Compiled 87 tackles (56 solo), two INTs for seven yards and nine passes defensed ... Added two fumble recoveries, one forced fumble and three QB pressures ... Contributed a team-high 14 special teams tackles and four kickoff returns for 100 yards ... Became the first Tennessee player to earn back-to-back All-America nods since G Chip Kell (’69-70) ... Named the Jim Thorpe Award Winner as the nation’s top defensive back ... A member of Sports Illustrated’s All-Decade Team ... Won the Vince Dooley Award as the top defensive back in the Southeast and the Tennessee Sports Hall of Fame Male Amateur Athlete of the Year Award for the second straight year, as well ... Earned All-SEC honors ... Voted team captain. 2008: Opened 12 games ... Compiled 72 tackles (44 solo), 3.0 sacks, seven INTs for 265 yards with two TDs and 13 passes defensed ... Also had two kickoff returns for 32 yards, seven carries for 37 yards and one catch for three yards ... An unanimous All-America selection ... Named the SEC Defensive Player of the Year ... Garnered the Jack Tatum Award as the best defensive back in college football ... His seven INTs tied for first in the NCAA ... His 265 INT return yards were the top single-season total in SEC history and school annals. 2007: Started all 14 games ... Tallied 86 tackles (57 solo) with 2.0 stops for loss, five INTs for 222 yards with a TD and nine passes defensed ... Added two fumble recoveries and one forced fumble ... Named the National Defensive Freshman of the Year by College Football News ... Earned consensus Freshman All-America accolades ... Named the SEC Defensive Freshman of the Year by The Sporting News ... Majored in Psychology at Tennessee. High School: A Parade All-America selection as a senior at Creekside High School in Fairburn, Georgia where he played QB and DB ... Named the Georgia High School Player of the Year by Gatorade and the Atlanta Journal-Constitution ... A starter in the U.S. Army All-America Bowl ... Also competed in track ... Set school records in the long jump (22’ 8’’) and the 200-meter dash (21.76 seconds). • Selected jersey #29 with the Chiefs to honor former UT teammate DB Inky Johnson, who suffered a severe shoulder injury in 2006. • Interned in a dental office while in high school. 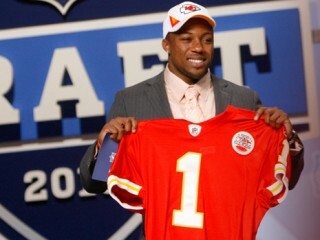 View the full website biography of Eric Berry.